The integrated bag and finger skirt compromises between the flexibility of the finger skirt and the economy of the bag skirt. It is the most complex and sophisticated Hovercraft skirt - a combination of a pressurized bag skirt and finger skirt. This combination uses the positive aspects of both skirt designs while only implementing marginal disadvantages of the finger and bag skirt. You will see this skirt design in nearly all commercial craft and some noncommercial. Detail of commercial Bag and finger skirt as used on the Hover ferry. The advantages are a relative smooth ride over most uneven surfaces with the finger section quickly adjusting to the surface contours. Low friction from the small cross section of the finger compared to the wide and relatively inflexible bag skirt. As shown in several tests it is seldom that you damage several finger at the same time and it is easier to repair in the field once damage occurs than a bag skirt. Even with the partial loss of up to 3 finger your craft will fly safely. Most of the time you can get your craft at a save location if not even back to your home base or trailer. It is easier and more inexpensive to replace some finger than a whole bag skirt of a craft. All patches and repair on a bag skirt will only be quickly chaffed off if they are close to the "ground contact" line. While a replaced finger has the same ground contact shape as all the other finger and will not be worn off quicker than the surrounding finger. Reduce "plow in" compared to a racing finger skirt provided by the upper bag section of this skirt. The bag section is not only a flexible attachment for the finger but as well a pressurized flexible cushion to the craft. The bag section provides higher stability to the craft while absorbing great forces to the bow and side section just before "plow in" would occur. In the integrated bag and finger skirt ( short B/F-skirt ) the bag section can be easily drained once water found its way in. Several small drain holes in the bags aft section will allow the water to drain out of your skirt and hold craft weight low. Where there is a lot of sunshine is always some shadow - the biggest disadvantages of the B/F-skirt are the high weight, big amounts of material and much labor to build. Because of these downsides this skirt design is not at all useful for a racing craft. A craft mostly used over ice or smooth water would as well not benefit from the B/F-skirt. For all cruising craft with a mixed use of land, water, ice and uneven terrain the skirt would provide the biggest benefit. If you use your craft over not totally frozen bodies of water you could reduce damage from floating ice. As you see the skirt selection is mostly done from the final application of your craft. 1.) Dimension of bag section and finger. 4.) Apply to craft and adjust bounce web. 5.) Set your craft on temporary feet, start lift and mark ground contact line on finger, cut in shape and enjoy flying. Before you can get your bag and finger cross section you have to determine your actual hover height which should be about 10% of your craft width. Once you know your hover height the bag section should provide 10 - 20 % and the finger section the remaining 80 - 90% of your final hover height. Hold in mind that your bag section has to provide a section which is parallel to the surface to attach your finger. Once you have the shape you can either make a temporary mock up to get the dimensions or follow bag skirt and finger skirt pages for the dimensions. Take the dimension (length ) from the lower skirt attachment line and top skirt attachment line of your craft. 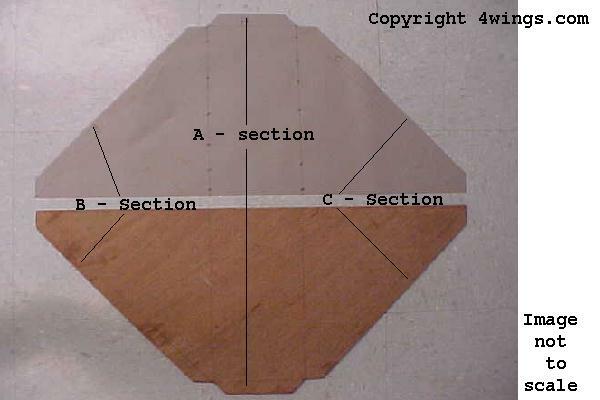 Mark and cut the fabric as well as mark the final glue joints. Start with the side sections of the craft , and mark the bag skirt section first, remaining fabric can be used for finger. On the outer surface of the bag skirt panel mark the location of your finger - it is useful to start from the CL of the bag and work yourself to the aft and front corner. Leave the last 1 ? ? ( or 50 cm ) open for the final corner finger - which can be easiest done if your bag skirt panels ( side and front / aft ) are temporary glued together. Mark the corner glue joints and don't forget to allow at least ?? ( or 1.2 cm ) for overlap and glue joint. Turn the bag skirt fabric around and mark location of the bounce web. Once you have all lines on the fabric, make a template of a single finger and mark to the left over material. Satisfied with the layout start cutting all the finger and bag skirt sections. Lay the bag skirt sections (sides of craft) on a flat surface and make sure that there are no wrinkles in the fabric. Glue every second finger ( reference point A ) to your bag skirt section. Allow enough time for the glue to set before bending them over and glue one side section ( reference point B ) to the bag section. Do not attempt to glue both at the same time since this would loosen the wet glue joint. 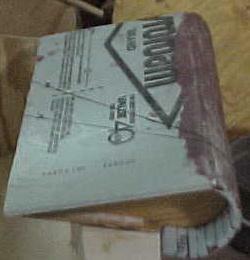 After the glue has adequate set apply the last finger section ( reference C) to your bag section. Once you are done with the first set apply the remaining finger ( every second one) on glue joint (reference A) to the bag section. Allow at least 24 hours for your glue to set before applying the side sections of these finger in the same building sequence as described above for the first set. Before gluing the finger to the front and aft sections of your skirt verify your CoG on the craft and be sure that the fingers ground contact line will have an equal distance ( CoG to front ground contact line as well as CoG to aft ground contact line.) to the CoG. Only if this is the case start gluing the finger in the same sequence as on the side panels of the skirt. Once all finger are attached to your bag skirt section decide on a nice and clean layout for the corner finger. This is best done when you glue the corners of the bag skirt along the lower corner together while the fabric is still laying flat on a surface. Even if it is very time consuming to apply the corner finger - if you rush now you will increase friction of the craft. Once you have all finger in place you can turn your skirt around and it should stand on all the finger 45 degree pointing upwards. 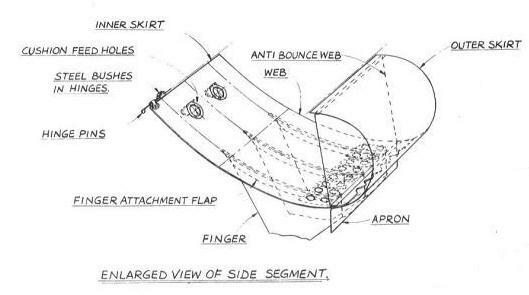 Apply the bounce web to the inner side of the skirt and if you are 100% confident that the dimensions are correct - glue as well to the top craft attachment line (not recommended). Now is the best time to glue all corner joints on your bag section. More or less done deal. Once your skirt is all glued and well dried - you can start to attach it to your craft - start with the aft lower craft attachment line and work yourself forward. 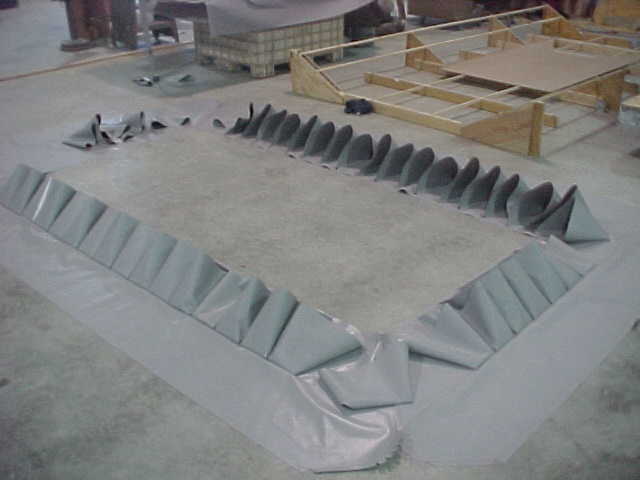 Once the skirt is attached to the lower hull set your craft on a leveled surface. Now the bag and finger skirt should lay quite flat to the floor and it is the best possibility to attach the bounce web ( temporary with SS staples ) before you fold the bag section over and attach to the top hull attachment line. When the skirt is all sealed it's time to start your lift unit and apply pressure to the skirt - the bag section should inflate while the finger should slowly expand and hold the air under your craft. Most of them will be tucked under the craft and show wrinkles in the ground contact line. If you have no major wrinkles in the bag section and the appearance is more or less smooth it's time to get to the final adjustment of the finger. Final adjustment. Try to support your craft on a leveled surface to actual hover height. The easiest way is to let the lift unit lift your craft and slide precut temporary feet under the craft. Once you have supported your craft even - reduce lift pressure to just over idle. This should provide enough pressure to hold the bag section inflated and apply a small amount of pressure to the finger. Mark all finger along the ground contact line and shut lift unit down. Once the pressure escaped from your skirt it is relatively easy to cut your finger in shape. Just for safety reasons leave at least ?? (1.2 cm ) from your marked ground contact line to the actual cut. Once all finger are even the required air volume should be less and friction between surface and finger nearly nothing. Start your lift unit and your craft should fly gently off the temporary feet - ready for your first test flight.